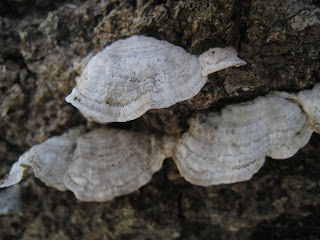 Here are some conks growing on a Basswood tree at Westwood. Conk is a generic term for any tough, woody, shelf-like or stemless mushroom growing on a tree or log. 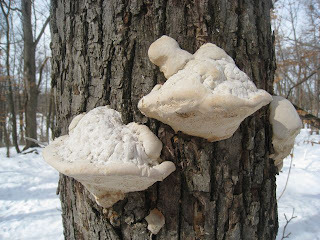 Conks are typically members of the Polyporaceae, or polypore mushrooms. 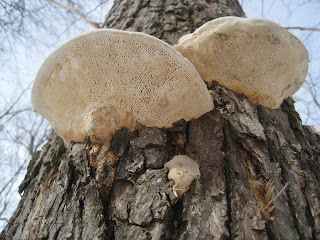 Polypores have pores instead of gills. There are no rules or exact definitions for what makes a mushroom a conk or not, it just describes the look (sort of like a toad is a bumpy frog that hops instead of jumps). Below are a few smaller mushrooms I found growing on a log. I wouldn't call these conks. They are on the paper side of woody. My generic term of choice would be shelf fungus. On the same log I found another group of mushrooms. These I definitely wouldn't call conks. 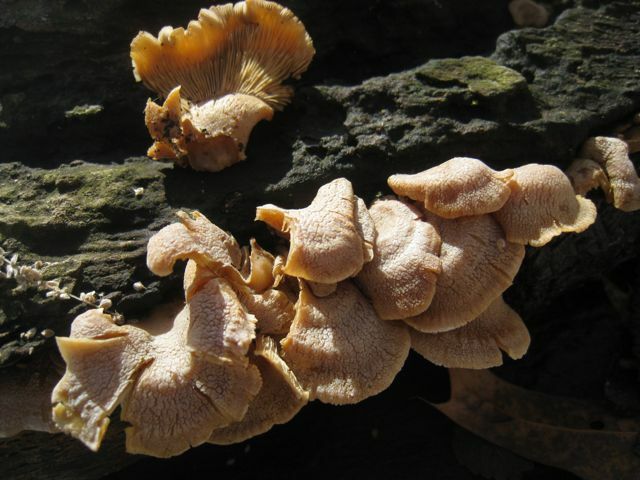 They are too fleshy, and you can see in the top mushroom, they have gills. I would call these little brown mushrooms! Back to the first mushrooms. I plan on revisiting them throughout the year to see if they grow. Some conks are perennial fruiting bodies that continue to grow every year and you can sometimes see rings that indicate this growth, like in a tree. I've said nothing as to these mushrooms actual identity. The names I've used (conk, shelf fungus, little brown mushroom) really tell us nothing other than a vague description of their appearance. I don't know what they are, I was looking at them in a more aesthetic frame of mind.